Meditation is for everyone no matter what spiritual practice followed. Christians, Jews, Buddhists, Muslims, Agnostics, or seekers searching for a path can benefit from this work. As we notice our own shifting awareness and tune into our ever expanding sensitivities, we may begin to wonder why we are more aware of outcomes. Or perhaps we begin to see movement out of the corner of our eyes or perceive colors around plants, animals or people. We might be moving into new dimensions as we hear tones associated with colors, or simply peer through the previously unseen veils to other worlds. As stated above, this material provides a life-changing opportunity for people at any stage of personal development or spiritual quest. The comprehensive 30 video course Meditation – An Inner Vision Journey offered through Udemy.com, can be accessed below. Udemy, the world’s leading on-line marketplace for learning, reaches an audience of over 9 million potential students. The Inner Vision Journey Guidebook is designed to guide you through a series of exercises and practices that can help you establish a solid meditation practice resulting in unimagined fulfillment and joy. The answers we seek are often veiled because of how the lower mind loves to interfere with guidance from the higher mind. Guided to the surface, your inner wisdom can be unlocked to reveal the cause of pain and life’s eternal challenges. Inner Vision Journey provides a framework to establish and enhance your meditation practice. Download free meditations or the entire 30 video series of the Inner Vision Journey Guidebook: Your Path to Heightened Awareness & Insight by Cherie Peterson https://www.udemy.com/meditation-an-inner-vision-journey/? 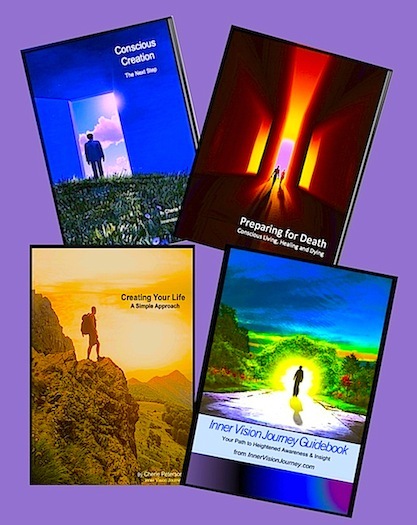 Discover these other life changing E-Books and other materials from Inner Vision Journey. InnerVisionJourney.com does not warrant the accuracy, timeliness or completeness of the information contained on our website or various materials offered by Inner Vision Journey. If you have a particular complaint about something you’ve found, feel free to contact us and share your views and opinions so that we might consider adjusting the related content accordingly. If you are the owner of material that is linked to on InnerVisionJourney.com and wish for it to be removed please contact us and it will be removed. 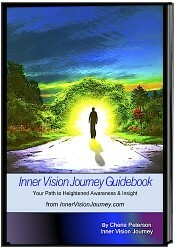 DISCLAIMER: InnerVisionJourney.com contains e-Books, blogs, seminars, videos, published articles, speculation, assumptions, opinions as well as factual information an materials from other sources. Information on this site may or may not be true and is not meant to be taken as fact. InnerVisionJourney.com makes no warranty as to the validity of any claims. COPYRIGHT: All images on InnerVisionJourney.com and related materials are readily available in various places on the Internet and believed to be in public domain. Images posted or published are believed to be posted or published within our rights of copyright laws. If you are the owner of material that is linked to on InnerVisionJourney.com and wish for it to be removed please contact us and it will be removed.